Caught the last three song's tonight and was happy with their diverse performance. Some of the songs where very upbeat and everyone dancing, while others were more sober. 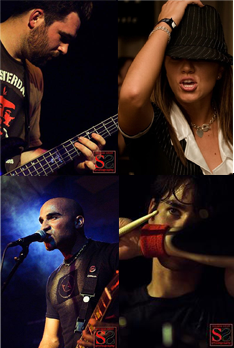 The five members of the band used acoustic and electric guitars, bass, drums, keyboard, bongos, chello, and a shaker! Any band that is able to successfully incorporate bongos into their songs are automatically cool. I can imagine Christopher Walken charging in and saying "I need more shaker!" I was impressed not only by the variety of music, but also with his ability to get scores of young women to the dancefloor. I learned about the benefit night at Iota tonight at the last minute, so wasn't able to round up anyone to go with. I thought it was a great idea to have a charity night there, even though there was a small turnout for a Tuesday evening. I got there early and saw some of Justin Trawick's performance, which featured his great voice and acoustic talent as well as a solid backup sound by a double bass. Donations at the door went to the Leukemia & Lymphoma Society, which is a great organization that my friends are also currently raising money for. Help my friends out by donating online! Wednesday night is here again and that means no cover at IOTA for open mic night. Can't wait until Friday when Boxcar Collision makes another appearance there. BTW they are now scheduled to go on stage at 9:45pm. 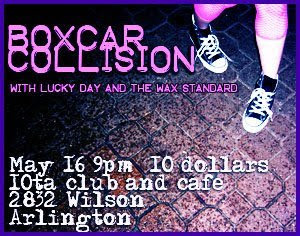 Lucky Day is debuting their new album and also performing with Boxcar. With mega-hottie Victoria Patchen on stage there is no excuse to miss this Friday's lineup. Alot of people including me are regretting going anywhere near the Radiohead show this weekend in Bristow. Not many fans got to see them perform, as a domino effect of horrible traffic, insane rain and wind, flooded side streets, and other craziness turned the night into chaos. Read a typical fan's story on the dcist blog for a taste of the night. Did I mention ending up in a hosptial room with hypothermia is not how any of us planned to end Mother's Day? Thanks Nissian Pavilion, thanks alot for charging $80 a ticket and most people get turned away due to poor crowd management. 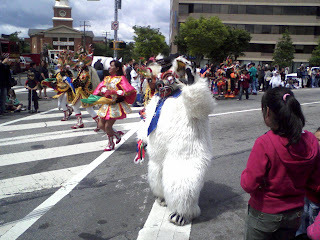 Today was the 12th annual Neighborhood Day festival on Wilson and Clarendon Blvds. The day started with the Battle of the Boulevard 10k run and 2k walk that unfortunately got rained on. Still some athletes refused to let the weather stop them and stayed around for the events after the race. Live music by Dr Foo started off the day. 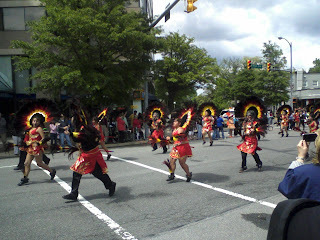 A multi-cultural parade at 1pm included an impressive number of Mexican and Bolivian dancers. And the Clarendon Grill hosted an arts and crafts fair if you wanted to pick up some last minute handmade jewelry for Mother's Day. Iota's open mic Wednesday had a good selection of acoustic players, and one unexpected surprise: Shane Hines and the Trance. His "Acoustic Trio Industry Showcase" was comprised of two energetic guitars and a solid bassist. Shane Hines' ode to his anti-depressants "Way Up Again" was both fun and thoughtful. He finished the night off with his powerful solo song "Beautiful Day" about the death of his mother. Shane is coming back to Iota on May 31st for a show of his own. My friends were having a happy hour fundraiser for the Leukemia and Lymphoma Society at the Grill's patio, and I noticed this great sound coming from the stage. Rome For A Day was getting ready to play, a band I've never heard of but won't soon forget. The group had a energetic and strong sound and did a perfect rendition of a Queens of the Stone Age cover. They played a few of their own songs that I really enjoyed. Too bad the crowd wasn't responding to them, the Thursday night audience consisted of too many drunk guys trying to dance and hit on girls and failing at both embarrassingly. They will be back in Clarendon at the end of May for shows at RiRa and Whitlow's, I will definitely be there to see them again, especially with their uber-hot back up guitarist Ali.